If your NetSuite shipping process includes Advanced Ship Notice (ASN) requirements, you'll be pleased to learn that the next Pacejet for NetSuite release includes new automation features for EDI data mapping with SPS Commerce. Pacejet already provides features such as enhanced packing and an extended NetSuite data feed to record more complete shipping data with NetSuite fulfillments. 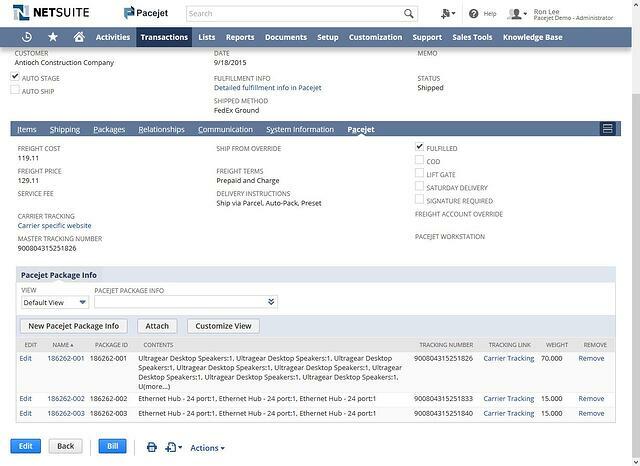 The Pacejet enhancements for SPS Commerce automatically map shipment, container, and item contents detail into appropriate SPS Commerce data fields in NetSuite so ASN EDI can be created quickly with less manual effort and fewer errors. 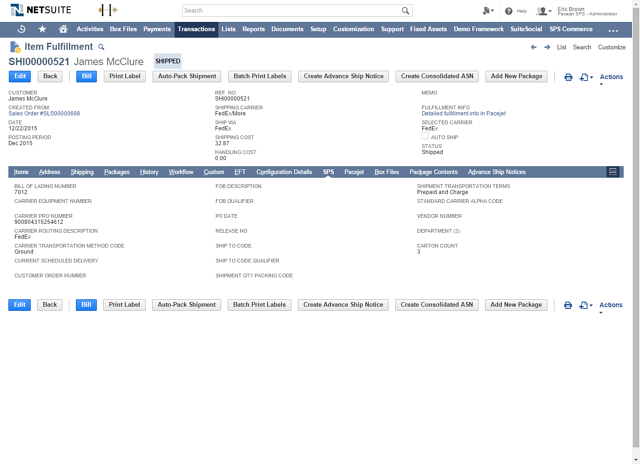 When shippers use Pacejet for NetSuite in the most basic setup, standard pack-and-ship functionality automatically records a number of additional useful data fields with NetSuite fulfillments. Container identifiers, dimensions, and weight (via electronic scale integration) are automatically recorded for each package in a shipment. Package records also include item contents information and tracking numbers. Additional shipment-level details such as shipping cost, shipping price, freight terms, special services, and delivery instructions are also captured and recorded as part of each NetSuite fulfillment record. 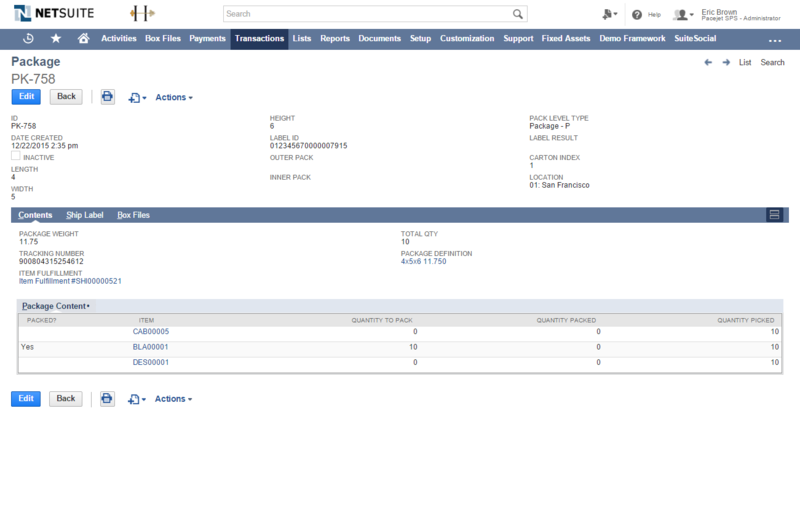 While the enhanced NetSuite fulfillment detail is very useful for customer service it also provides a foundation set of details needed for ASN EDI processing with SPS Commerce. 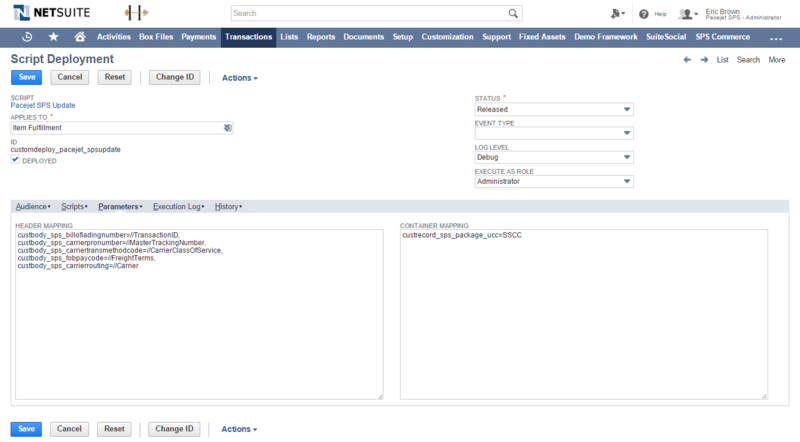 To enable easier data mapping with SPS Commerce, a new set of script deployment settings are now included in the Pacejet bundle for NetSuite. 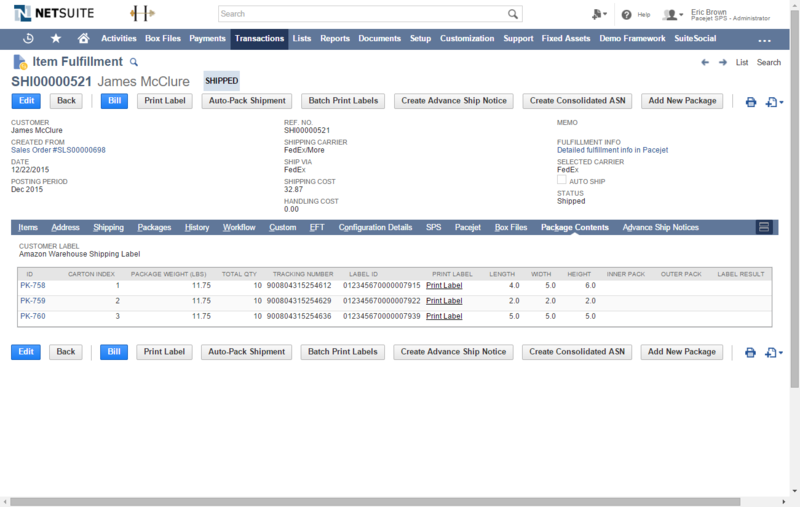 The script deployment settings include parameters for header-level and container-level data mapping to send enhanced Pacejet shipping detail into appropriate SPS Commerce fields to automate setup of ASN EDI (please note that an SPS bundle update is also required to enable this mapping feature, contact your SPS representative for more information). The configurable mapping identifies the EDI-focused SPS fields in NetSuite and links them via an "xpath reference" to the appropriate data in the extended Pacejet Feed data field in NetSuite. The loosely-coupled mapping defined via the new script deployments means that administrators can map their own additional or custom fields by adjusting the standard map. 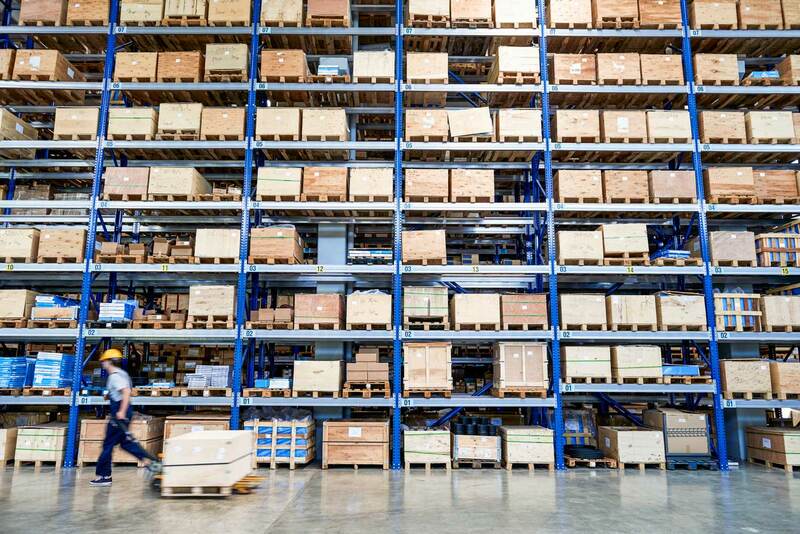 Out of the box settings for the new SPS Commerce data mapping include the most commonly required shipping data for a standard Advanced Ship Notice (ASN) EDI transmission. For example, package details such as weight, dimensions, carrier tracking numbers, and a package ID are automatically setup as part of shipment processing (as shown below). And the standard map also includes some additional header-level data fields such as a carrier Pro Num, Carrier, Class of Service, Carton Count, and Freight Terms. Interested in learning more about how to use the new SPS Commerce data mapping tools for your ASN EDI requirements? Contact us to learn more about the new feature and get involved with using the tools in your shipping process.